Here is an unusual set of toys. 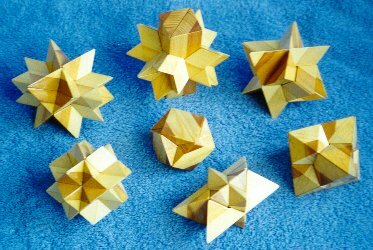 You can easily recognize among them the Oriental "Hedgehog" puzzle,also called "Diagonal star" which is at least 2000 years old. The others are fairly new. But despite a solid age difference, they are all brothers. Each is assembled of 6 identical parts, but the parts are interchangeable and can be assembled in any six compositions. The reason is quite simple. The "Hedgehog" is a star-like form of a well known polyhedron - the rhombic dodecahedron. It's a polyhedron with several star-like forms. They are attained by elongating the sides of the "Hedgehog" to self-crossing. These figures are remarkable indeed. Choosing any six elements of them and assembling them in a whole, we get something unexpected: however this "synthetic monster" can be asymmetrical, it would always have exactly 12 sides, intersecting in most unusual ways. 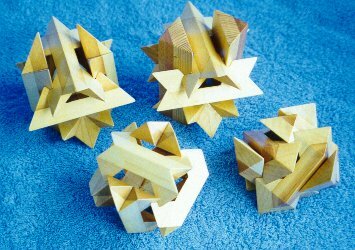 Other figures are produced by elongating the sides of the elements to the points of inter-section with cubes of various sizes or the octahedron. Adding their parts to the other figures, the number of possible combinations is 4 or 5-digit (try to count).